Atlanta native, Caroline Bullock creates mixed media abstract works whose primary inspiration is the human relationship with the natural world. Bullock is interested in how we attempt to create our perceived human reality with complex systems of mathematics, science, and technology, but with nature as the backdrop and laboratory. Mathematics is the language of nature, but it also distorts the perception of natural beauty and mystery. Technology allows us to explore the universe, but also encourages us to manipulate nature to our peril. She is intrigued by our innate proclivity to impose rational explanations and limits upon what is natural, irrational and unconscious and to unmask life’s invisible mysteries. 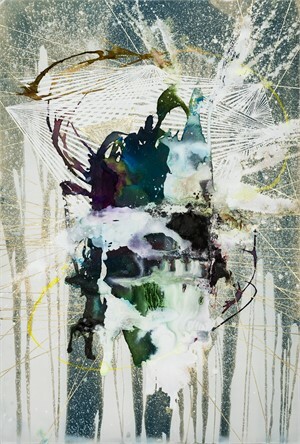 In her most recent work, Bullock is inspired by the multiverse or “many-worlds” theory of quantum mechanics. The idea that the 3-dimensional world may be just an illusion resonates with with her as an artist who creates paintings that are, in their very essence, nothing but an illusion. 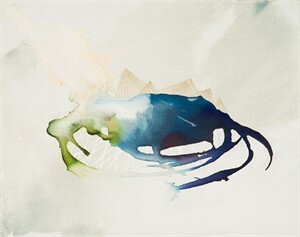 The paintings in the “All Possible Worlds” series juxtapose multiple mediums, that rely on both randomness and intention, with more direct elements such as photography and mechanical, geometric drawings. 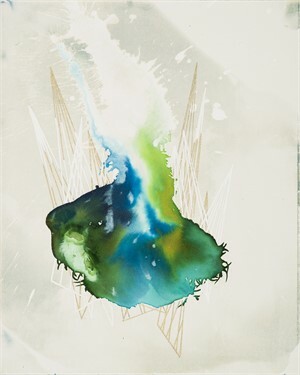 Inks and watercolors blend and react, creating forms that become almost organic in nature— flowing, bursting, seething, or vibrating—while the geometric drawings, intertwining amongst the ink pools, connote the structure as well as the energy of the forms, creating new and different worlds unto themselves. The process often seems in conflict, but the intent is to bridge these conflicts in a method that is primarily unexpected and always enlightening. 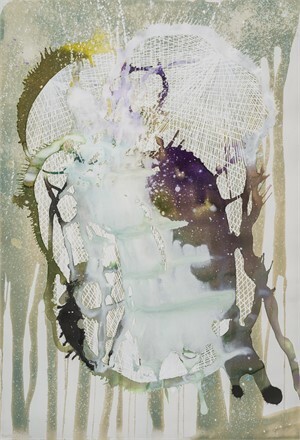 Atlanta native, Caroline Bullock creates mixed media abstract works whose primary inspiration is the human relationship with the natural world. Bullock is interested in how we attempt to create our perceived human reality with complex systems of mathematics, science, and technology, but with nature as the backdrop and laboratory. Mathematics is the language of nature, but it also distorts the perception of natural beauty and mystery. Technology allows us to explore the universe, but also encourages us to manipulate nature to our peril. She is intrigued by our innate proclivity to impose rational explanations and limits upon what is natural, irrational and unconscious and to unmask life’s invisible mysteries. 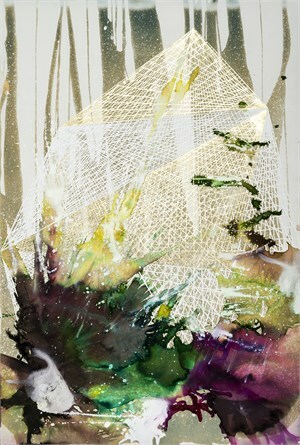 In her most recent work, Bullock is inspired by the multiverse or “many-worlds” theory of quantum mechanics. The idea that the 3-dimensional world may be just an illusion resonates with with her as an artist who creates paintings that are, in their very essence, nothing but an illusion. The paintings in the “All Possible Worlds” series juxtapose multiple mediums, that rely on both randomness and intention, with more direct elements such as photography and mechanical, geometric drawings. 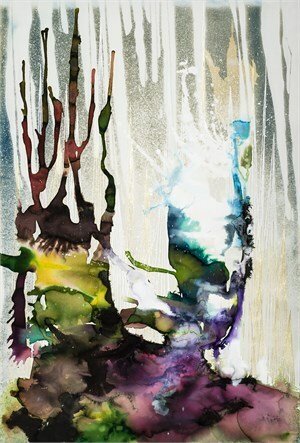 Inks and watercolors blend and react, creating forms that become almost organic in nature— flowing, bursting, seething, or vibrating—while the geometric drawings, intertwining amongst the ink pools, connote the structure as well as the energy of the forms, creating new and different worlds unto themselves. The process often seems in conflict, but the intent is to bridge these conflicts in a method that is primarily unexpected and always enlightening.